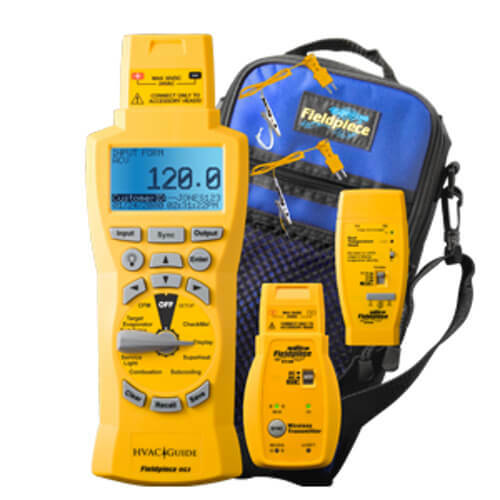 Fieldpiece JL3KH6 is a powerful set of 3 different smart probes: (2) pressure probes, (2) pipe clamps, and (2) psychrometers to easily and quickly provide a technician full AC system measurement readings including temperature, super heat, subcooling, pressure, dry and wet bulb, percentage of RH, dew point and enthalpy all at one time. These measurements are transmitted via Bluetooth to the Job Link App (available through the App Store or Google Play) on a mobile device up to 350 feet away. 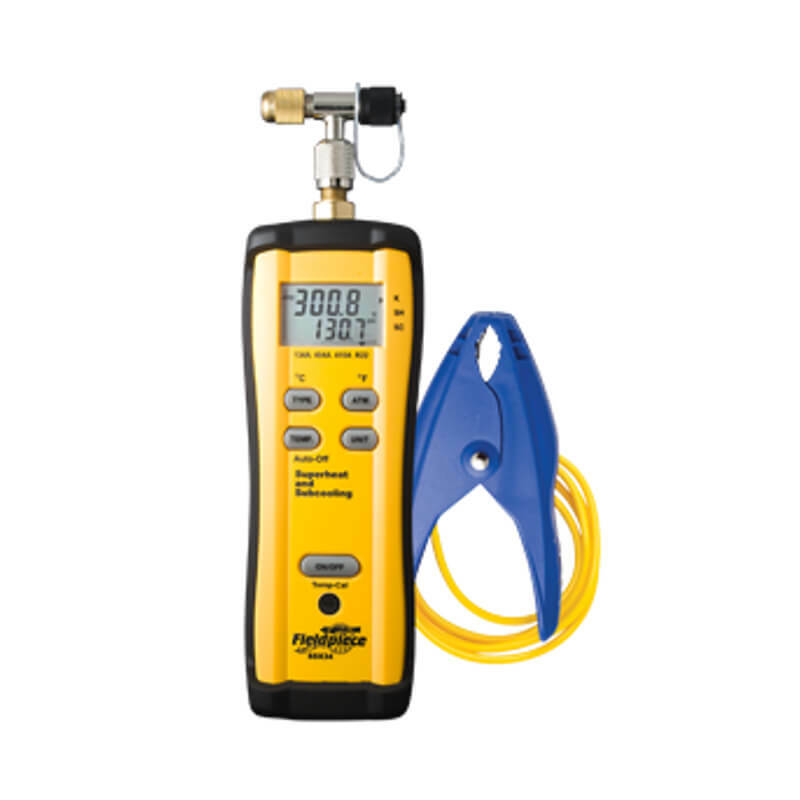 This portable set of smart probes are perfect for an HVAC technician to use when analyzing a residential or commercial system. The JL3KH6 smart probe set is designed to provide a technician both accuracy and flexibility while simultaneously getting real time measurements necessary to analyze a system. One unique feature with this wireless charge and air kit is the ability to switch from suction line to liquid line just by adjusting the switch on the bottom of each probe. No need to reconnect through the Job Link App, the app automatically knows which side you have selected for each probe. The pressure probes are designed with a 45º angles on ¼” fitting with shallow threads to easily reach service ports in tight spaces. These transducers have a measurement range of 0 – 580 psig, a maximum overload of 800 psig, and auto calibrate at any elevation to provide accurate measurements. The pressure probes have field replaceable O-rings and a water resistant rating of IP55. The pipe clamp probes have a narrow jaw with a Rapid Rail K-type thermocouple technology that will provide a technician the ability to get into tight spaces while providing the fastest as well as the most accurate pipe temperature measurements. The sensors use the pipe itself to complete the circuit so if you don’t get a reading it’s because something is blocking the electrical circuit. These smart probes let the user know by color and beeps whether the clamps have a good connection. The clamps can be used on ¼” to 1-3/8” pipes and have a temperature range of -50 to 257° F suitable for most residential and light commercial applications. The clamps also have a water resistant rating of IP55. The third set of instruments in the kit are the two flexible psychrometer probes that measure %RH, dry bulb, wet bulb, dew point and enthalpy at registers, grilles, in a duct, or just walking around. These flexible probes have a strong adjustable magnet to easily hold the probe in just about any position to get a good measurement reading at supply plenums, ducts, and elevated registers. They have a measurement range of -4 to 140° F and relative humidity of 0 – 100%. 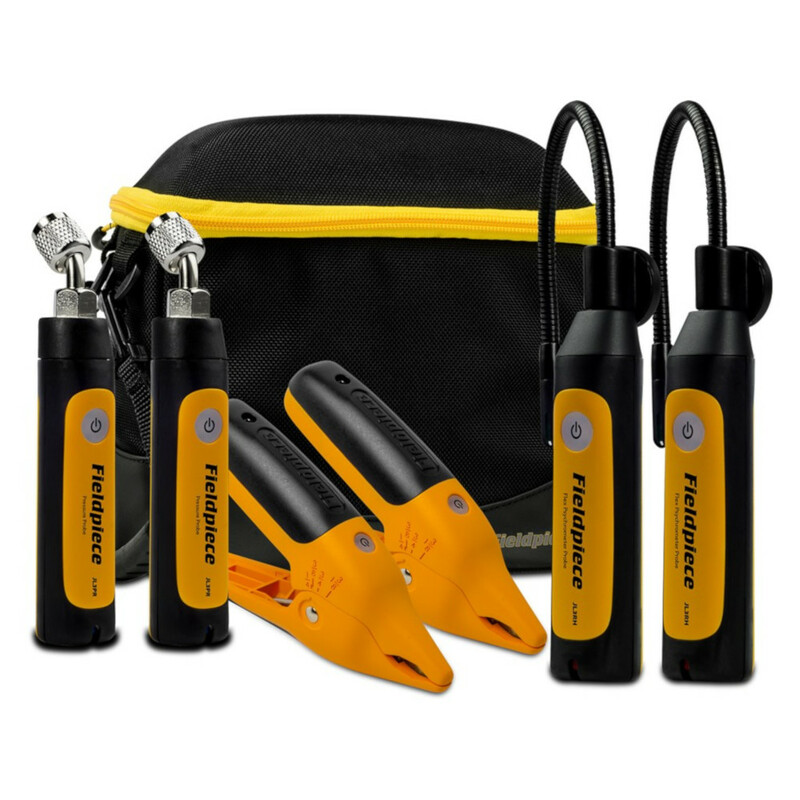 These wireless smart probes are easily brought to any job site in their compact padded carrying case with separate compartments for each probe. All probes operate using 2 AAA batteries and automatically power off after 2 hours of inactivity. If desired, the auto power off can be disabled by the user. Electrically conductive 1/4" to 1 3/8" (6.4mm to 34.mm) dia.